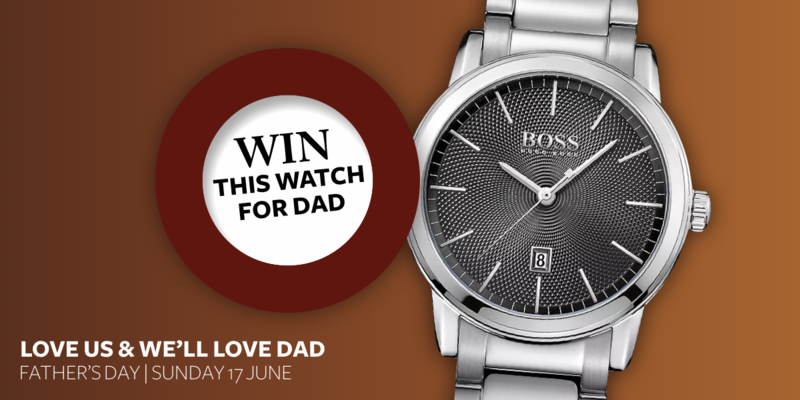 To celebrate Father’s Day, we’ve teamed up with Ernest Jones Jewellers to offer you the chance to WIN your dad a fabulous Hugo Boss Men’s Stainless Steel Bracelet Watch worth £159. To enter hop over to our Facebook page. Become a fan! Like Ayr Central on Facebook: https://www.facebook.com/AyrCentralShoppingCentre/ and leave a comment telling us why your dad is the best! If you already liked us on Facebook and would like to be included, please leave a comment telling the best thing about your dad. 2. The competition is open to all UK residents aged 16 years and over with a UK postal address except persons connected with this promotion. 3. The closing date is midnight 14 June 2018 and the winner will be notified by 5 pm, 15 June 2018. Become a fan! Like Ayr Central on Facebook. https://www.facebook.com/AyrCentralShoppingCentre/ and a leave a comment telling us why your dad is the best! If you already liked us on Facebook and would like to be included, please leave a comment telling the best thing about your dad. The prize is a Hugo Boss Men’s Stainless Steel Bracelet Watch worth £159. 13.Entry into the competition constitutes acceptance of the above terms and conditions. 15.The name and county/town of the winner will be available for one month after the competition closing date by sending a stamped addressed envelope to the promoter Ayr Central.